Disposable Concentric EMG Needle Electrode "Silver line"
The latest needle from Technomed Europe, combines cost-effectiveness with excellent quality, both for the signal as well as patient comfort and mechanical behaviour. Using the same cables as the "Pirouette" needles from Technomed, you can easilly switch over to this needle and start saving money without compromise. These disposable monopolar needle electrodes of stainless steel are PTFE Polymer coated. The needle point is conically sharpened. The exposed needle tip serves as the recording area. The 0.75 meter wire terminates in a safety DIN 42 802 (touch proof) connector on the AP (Prewired) models. The models without wire (AD=detachable) can be combined with reusable cables D54-551 or D34-231, which can be found here. The needle is made of medical grade stainless steel with an ultra-smooth coating and shapened with micro-precision. The facet bevel point guarantees several injections without any deterioration of the quality. The cable has a length of 75cm and terminates in a 1.5mm female DIN42802 connector. 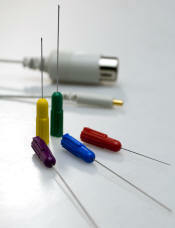 The needles are individually packed (sterile) and are delivered in boxes of 10 pcs.